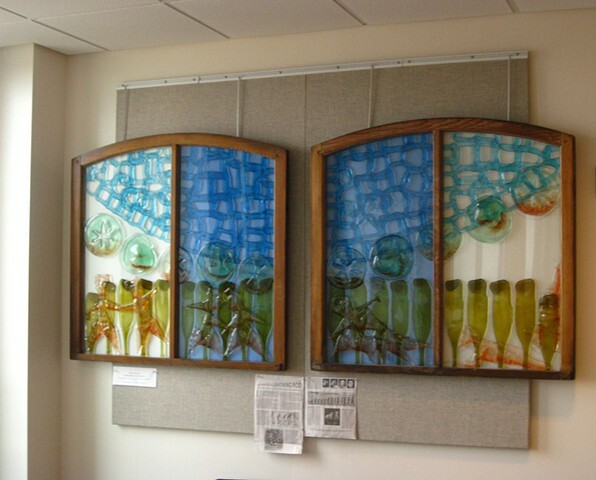 Recycled Glass Bottle Art by John Bassett - Here We Are. What's Next? Here We Are. What's Next? 39"h x 87"w x 2"
bottle glass, pink platters with red frit, colored glass, and plate glass in old sash. I was thinking of the often used evolution cartoon showing progression from rodents or small monkeys to man. The sash are meant to be 4" apart, so that the arc of the blue rectangles is continuous.